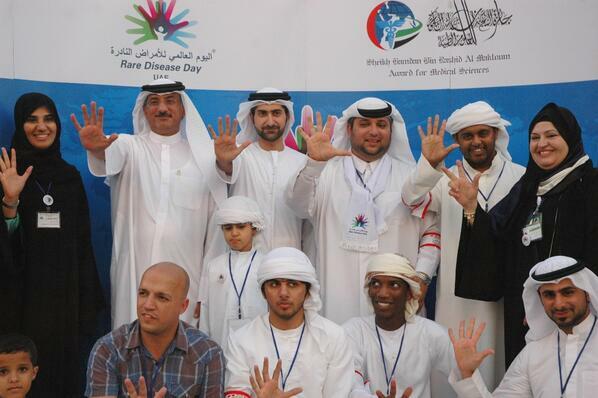 For the fourth successive year and under the slogan "Join Together for Better Care", Sheikh Hamdan Bin Rashid Al Maktoum Award for Medical Sciences held a special gathering to mark the World Rare Disease Day. This took place at Zayed bin Mohammed Family Gathering in Al Khawaneej, Dubai, with the attendance of around 700 children with rare diseases and their families, in addition to doctors, geneticists and visitors of the venue. Mr. Abdullah Bin Souqat, the Executive Director of Hamdan Medical Award, said that the celebration comes within the framework of the award’s ethos to support all as many people as possible and fulfill its commitments towards the society. “Through this year’s educational and entertaining celebration, children with rare diseases and their families have participated in an open family day, whose activities have helped them to be integrated in the society and enhanced their abilities to cope with their diseases”, he said. “These activities could be divided into two main parts; the first one includes entertainment activities for the children, whether they are diseased or not. Of this kind of activities we can mention face painting, painting with henna, taking photos with the logo of rare disease day and playing with favorite cartoon characters as well as participating in many interesting competitions with prizes. As for the second part of this event, it was held with the participation of members of the public to shed light on rare diseases, preventive strategies and methods to cope with them. Dr. Fatima Bastaki, Consultant Pediatrician and Clinical Geneticist as well as the chairman of the Organizing Committee, expressed her sincere thanks and appreciation for Hamdan Medical Award for organizing such this event annually. She said: “Patients with rare diseases need to feel that they are not alone and it is great for them to be supported by individuals and institutions in their own communities”. Dr. Fatima Bastaki alluded to the valuable information the participants received during the celebration about types of rare diseases and ways of prevention. Most of these conditions are hereditary, and their prevalence could be reduced by following simple procedures such as the premarital tests, newborns screening as well as tests during pregnancy, especially in cases of having a family history of one of these diseases. “Smiling faces of patients and their families were the most distinguished feature there. They have managed to overcome their sickness and mingle with others”, she said.